We flew to Majorca from Manchester and on arrival, picked up a rental car. Easier said than done. Apparently, the company we had selected required an International Driving License - something I hadn't seen since the 1970's. After a one hour wait, they refused to rent us a car but fortunately Hertz wasn't as difficult and eventually, we were on our way. We stayed in Alcudia, which is on the north coast of Mallorca. We had rented an apartment through AirBnb. We arrived quite late after our problems at Mallorca Airport but fortunately we were still able to meet our host who showed us around the apartment. It was a one bedroom apartment in a high rise building with a balcony. Although we were probably half a mile from the sea, we did have a view of the ocean over the rooftops. 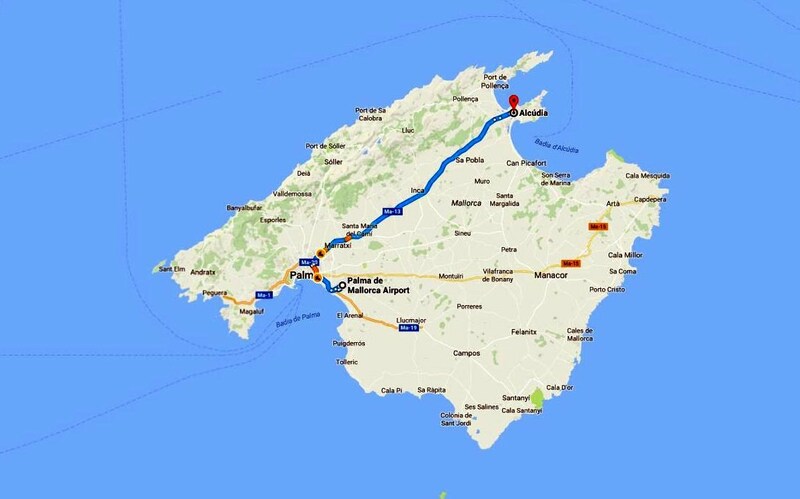 We spent the next week driving around Mallorca, exploring all the usual tourist locations, starting with Alcudia itself. The old town of Alcudia is actually a walled city and all the streets are pedestrianized, so you park outside and walk in. It's a great place to go for dinner in the evening. Some of the restaurants are fairly small. Some are very elaborate - like this one decorated with roman statues and an elaborate ceiling. Very "trompe l'oeil". Note the cherub sitting on the rail watching the diners below. Once we had explored the local surroundings, we started to explore further afield. Our first day trip was to the capital, Palma. Palma Cathedral dominates the skyline and overlooks the harbor. It was built between 1229 and 1601 and restored in 1901 by Gaudi. The wrought iron canopy added by Gaudi in 1909. The knave is higher than Notre Dame in Paris. After the Cathedral, we spent the rest of the day wandering around Palma, before heading back to Alcudia. Our next excursion was to visit Sa Calobra creek. Although the creek is pretty enough, it's the winding road known as the Carretera de Sa Calobra that makes this a place to visit. The 13 km road, built in 1932, has no tunnels, so it winds down the hillside, with some terrifying curves. Next time, I will bring my bike and ride it myself ! This is a very popular ride with cyclists - I can only admire their determination ! After Sa Calobra, we visited Puerto del Soller, where I had stayed in the 1960's with my parents. It's a pretty little town built around the bay. The port is filled with pleasure craft, as you might expect. The tram connects the Port to the main town of Soller about 5 km away. It opened in 1913. The lighthouse was a busy and popular spot. All the cars were waiting for a parking space. However, it was well organized and the wait time wasn't too bad. The lighthouse is still working and is the highest in Mallorca. Even the goats agree the view from the top is worth waiting for. After six days in Mallorca, we moved on to our next destination, Provence in Southern France.